We recommend that towing be done only by an expert repairer, we recommend an Authorised Mazda Repairer or a commercial tow-truck service. Government and local laws must be followed. 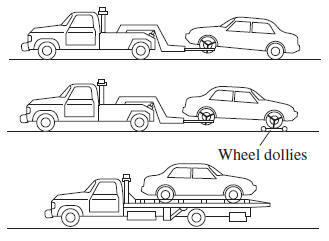 A towed vehicle usually should have its drive wheels (front wheels) off the ground. If excessive damage or other conditions prevent this, use wheel dollies. Do not tow with sling-type equipment. This could damage your vehicle. Use wheel-lift or fl atbed equipment. If towing service is not available in an emergency, the vehicle may be towed with all four wheels on the ground using the towing hook at the front of the vehicle. Only tow the vehicle on paved surfaces for short distances at low speeds. Follow these instructions when towing the vehicle with all wheels on the ground. Shift to neutral (Manual transaxle), or the N position (Automatic transaxle). Remember that power assist for the brakes and steering will not be available when the engine is not running.